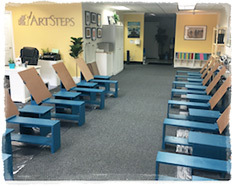 We are excited to announce our brand new Costa Mesa studio! Conveniently located between the 405 and 55 freeways for easy access from Huntington Beach, Newport Beach, Fountain Valley, and South Irvine, our new studio is nestled in the charming Mesa Verde Plaza center, right next door to OC Tae Kwon Do. With a passion for art and a commitment to care and excellence, we are so excited to fill the vital need for quality art education in West Orange County.